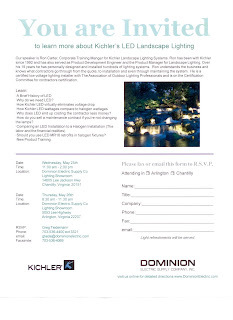 Are you an electrician or landscape contractor? If so, then we have some training for you! Wed. May 25th from 11-2 in the Chantilly showroom (lunch will be served). Thu. May 26th from 8:30-11:30 in the Arlington showroom (breakfast will be served). Ron’s continuing passion for landscape lighting fuels his desire to help contractors and distributors alike how to best understand these types of products and how to utilize them to their full potential with safety as the number one concern. Having personally designed and installed hundreds of lighting systems over the 19 years he’s been at Kichler, Ron understands the business and knows what contractors go through from the quote, installation and even maintaining the system. He is also well aware of the pitfalls a contractor can go through when they inherit a system they did not install. ~ Why do we need LED? ~ Why does LED end up costing the contractor less money? ~ How do you sell a maintenance contract if you’re not changing the lamps? ~ Should you use LED MR16 retrofits in halogen fixtures? Please let me know if you would like any further information. If you are able to join us, please RSVP to me (cschla@dominionelectric.com) or Greg Tiedemann (gtiede@dominionelectric.com). We look forward to spending time with you!